Yes, Pomarańczarnia Apartments have one baby cot available for rent. The baby cot fee is 50 PLN per stay. Is there a possibility to add extra bed into an apartment? Yes, Pomarańczarnia Apartments have two extra beds. 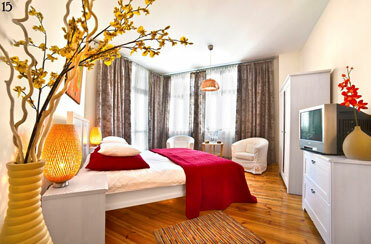 The extra bed fee is 50 PLN per day. What is the fee for a lost parking remote control? The lost parking remote control fee is 70 PLN. What is the fee for a lost key? The lost key fee is 100 PLN. Is there free Internet access and TV in all apartments? Yes, all our apartments have TV sets and free Wi-Fi access. Is it possible to bring a dog or a cat? Yes, the pet fee is PLN 50 per stay. No, all our apartments are non-smoking. Violation of this rule results in a 150 PLN fee. However, many apartments have a balcony. Apartments with a balcony: 10, 11, 12, 14, 15, 16, 20, 21, 25, 105, 107, 203. There is a smoking room in the apartment 5B. Is there a kitchen or kitchenette in all apartments? Yes, there is a fully equipped kitchen or kitchenette in every apartment. Where is the breakfast served? After placing the order at the reception, breakfast is served from 8.00 until 10.00 in Pierogarnia at 22 Rybaki street – right next to the Apartments reception. There is a hair dryer in every apartment available for our guests. Is there air-conditioning in the apartments? Our apartments are not air-conditioned. The exception to this rule is the apartment No. 25, which is located in the attic – it has an air-conditioning unit. Are there towels in the apartments? Yes, each apartment has towels for the number of guests indicated in your booking. Is there a bathroom in every apartment? 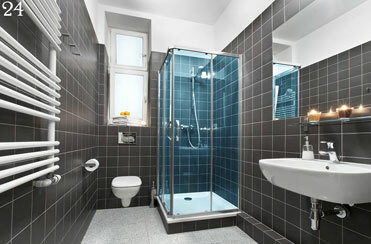 Yes, each apartment has a private bathroom inside the unit. The only exception is a single room 10a, which has its private bathroom outside the unit. 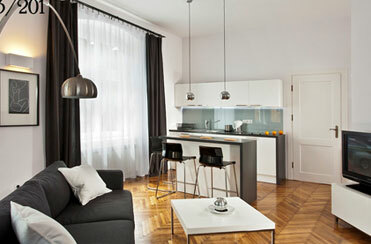 At Pomarańczarnia Apartments, check-in time is from 2pm and check-out time is until 11am the next day. At this time you should vacate the room. Is there car parking available at Pomarańczarnia Apartments? Yes, we have 10 parking spaces in an unsupervised (but equipped with CCTV cameras) square located 100 meters from the Apartments. The square is surrounded by a wall with a remote controlled gate.